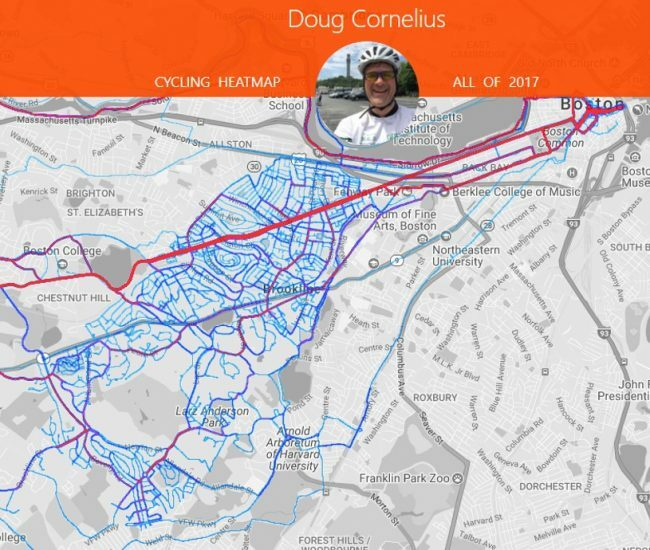 I use Strava to track my bike rides. (I like data.) The website’s heat map tracks my rides showing where I have cycled and where I have not. Like a toddler, I feel that I need to fill in the lines. This year, I set a goal to ride all the roads of Brookline during my bike commutes. At least mostly done. Brookline has lots of private roads. VERY private roads. So there are some road lines that are empty because the roads were blocked physically or were imposingly private. You can also see there is a big hole in Brookline. That is where the public Brookline Golf Course and The Country Club reside. There is a plethora of those private roads around them. You can see that big, bright red line on Beacon Street. That has become one of my favorites roads for bike commuting. 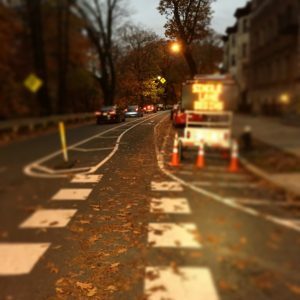 Brookline has separate bike lanes for most of Beacon Street. It even has a short stretch of buffered bike lane. It gets tight in Coolidge Corner. But the cars are usually moving slowly as well. In 2015, I cycled all of the streets of Newton. In 2016, cycled most of the streets of Brighton, Allston, and Downtown Boston. What to do in 2018?